National Institute of Electronics and Information Technology, New Delhi invites Application for the posts of 120 Scientist ‘B’. Apply before 24 October 2016. Educational Qualification : B.E./ B.Tech in computer science/ Information Technology/ Electronices & Communucation/ Electronics & Telecommunication or M.Sc. Physics/ Electronics with one year relevant experience. How to Apply NIELIT Vacancy : Interested Candidates may apply Online through the website http://recruitment.nielit.gov.in/ from 23.09.2016 to 24.10.2016. National Institute of Electronics and Information Technology, Lucknow invites Application for the posts of 425 Data Entry Operator on contract basis. Walk-in-Interview 24 to 28 September 2016. Educational Qualification : Intermediate with one year Computer Diploma and minimum Computer Typing Speed of 15 words per minute for English and Hindi both languages. Application Fee : Candidates have to pay Rs. 500/- and Rs. 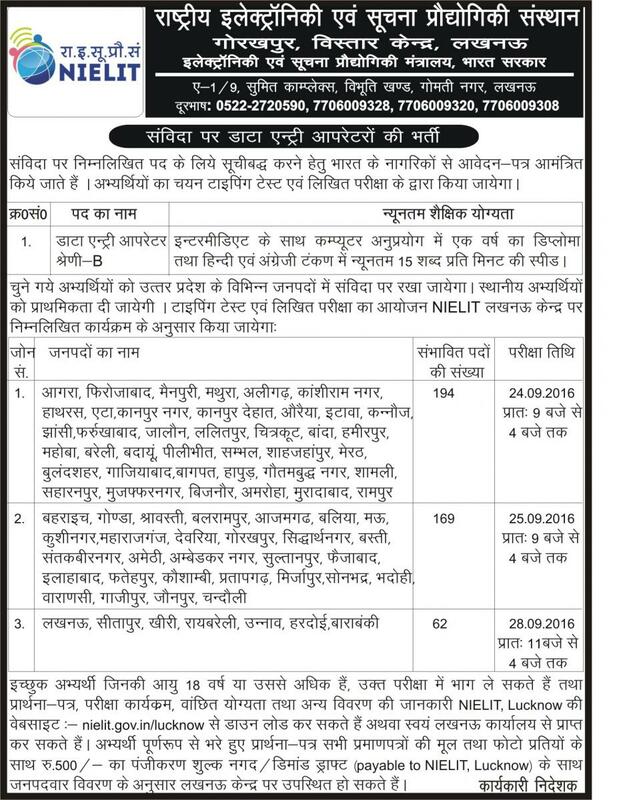 250/- for SC/ST/PWD through cash OR Demand Draft in Favour of NIELIT, Lucknow payable at Lucknow at the time of submitting the application form. How to Apply NIELIT Vacancy : Interested Candidates may appear for Interview along with Prescribed Application Form and self attested copies of their testimonials at the time of Interview. National Institute of Electronics and Information Technology, New Delhi invites Application for the posts of 07 Consultant & Senior Consultant on contract basis. Apply Online before 25 September 2016. Educational Qualification : BE./B.Tech. in Electrical / Electronics/Communication/ IT with First Division. How to Apply NIELIT Vacancy : Interested Candidates may apply online through the website http://nielit.gov.in from 19.09.2016 to 25.09.2016.